Pre-existing diabetes in pregnancy risks in the past were of great concern. It was hard for mothers with diabetes to conceive and carry live healthy babies to term. Before the advent of portable hand-held glucometers that provide quick results, disposable syringes, better medications and care guidelines, it was difficult if not almost impossible to achieve and maintain good glycemic control during pregnancy—let alone the tight glycemic control required to reduce risks. Back in the 1950's, it wasn't uncommon for people with diabetes who injected insulin to have what looked like a mini-laboratory complete with glass syringes that needed to be sterilized by soaking in alcohol and needles sharpened with a whetstone. Because glucometers were not available, blood sugar levels could not be attained easily or quickly. At that time, it was felt that women with diabetes could not and should not have babies. Many babies were stillborn because the higher risk for early breakdown of the placenta was not understood. Miscarriages, birth defects and life-threatening macrosomia (high birth weight) were common. The lives of both the mother and child were at risk. Tight glycemic control and risk reduction are easier to attain with today's knowledge, management guidelines, and tools. With good planning, obstetrical care and tight control of blood sugar levels, a woman with diabetes in pregnancy can have about the same chance for a healthy baby as a woman without diabetes. An A1c laboratory test is used to assess average blood sugar levels for the past 2-3 months. The normal A1c for a woman without diabetes during pregnancy is 6.3%. The higher the A1c level before and during pregnancy, the higher the risks are accordingly. Generally, it is recommended to keep A1c levels under 6.0%, but not too low to avoid significant risk for hypoglycemia (low blood sugar levels) or fetal growth restrictions. Talk to your doctor about your A1c goals. Tight control of blood sugar levels reduces risk of maternal, fetal and neonatal complications. After-meal blood sugar levels are the most strongly associated with high birth weight or macrosomia, also known as big baby syndrome. Before and During Early Pregnancy: Miscarriages and major congenital malformations. After 12 Weeks' Gestation: High insulin and glucose levels in the fetus, which can cause accelerated growth and excess fat. Macrosomia is associated with increased need for emergency cesarean sections, birth trauma, fetal death, and neonatal complications. During Late Pregnancy: High blood sugar levels in the fetus can cause hypoxia (inadequate oxygen supply) and acidosis in the fetus, which may be the cause of high stillbirth rates in women with poorly controlled blood sugar levels. There is also ​higher risk for preeclampsia, polyhydramnios (too much amniotic fluid) and premature labor. After Birth: Infants with macrosomia due to high maternal blood sugar levels are at higher risk for developing obesity and impaired glucose tolerance. Poor control during pregnancy can also affect intellectual and psychomotor development. Risks to Mother: Elevated blood sugar levels in pregnancy can also have long-term effects, including worsening of retinopathy and nephropathy. Read more about Diabetes in Pregnancy. Kitzmiller, MD, MS, John L; Block, BS, RN, CDE, Jennifer M; Brown, MD, Florence M; Catalano, MD, Patrick M; Conway, MD, Deborah L; Coustan, MD, Donald R; Gunderson, RD, PHD, Erica P; Herman, MD, MPH, William H; Hoffman, MSW, LCSW, Lisa D; Inturrisi, RN, MS, CNS, CDE, Maribeth; Jovanovic, MD, Louis B; Kjos, MD, Siri I; Knopp, MD, Robert H; Montoro, MD, Martin N; Ogata, MD, Edward S; Paramsothy, MD, MS, Pathmaja; Reader, RD, CDE, Diane M; Rosenn, MD, Barak M; Thomas, RD, Alyce M; and Kirkman, MD, M Sue. Managing Preexisting Diabetes for Pregnancy: Summary of Evidence and Consensus Recommendations for Care. Diabetes Care May 2008 31(5):1060-1079. 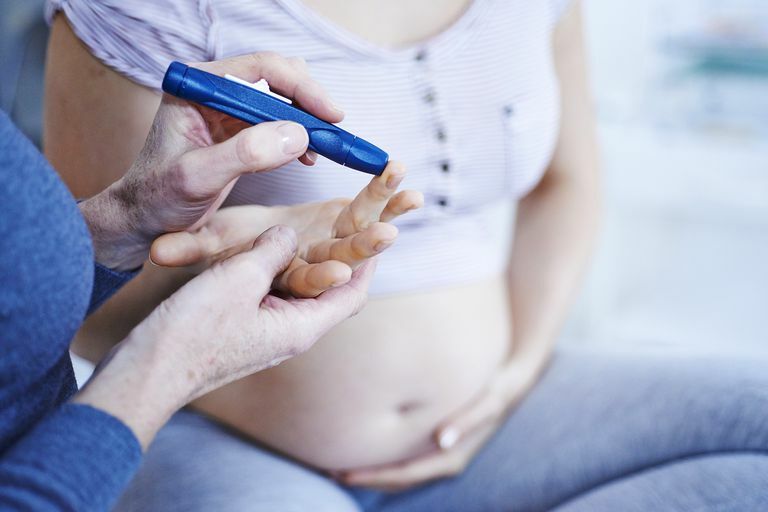 How Does Gestational Diabetes in Pregnancy Happen?